Well here we are at Friday. Yesterday's day 2 with Jeannie was delightful as always. Tucks, bullions and a new way to attach lace to a hem. Design Show was inspiring as always. A smocked fascinator, a gorgeous embroidered lap desk and an intriguing smocked lampshade. Show and Share featured many beautiful items as well but my favorite was a showstopping Madeira appliquéd and embroidered tea cloth. The stitcher who made it told me it took TEN years to stitch. That is dedication! There was also a Teacher's Showcase featuring class samples from many different teachers. Again always inspiring and exciting. After a quick dinner it was more visiting, stitching and laughing. Today's class is again with Jeannie Baumeister. Eyelet embroidery. I have been happy with my eyelets but not my shaded eyelets. That is my goal for this class, to improve those. This afternoon is market. An opportunity to shop for fabrics, patterns and tools. Always fun. Otherwise it is a much needed afternoon "off". I have raffle basket tickets to deposit in some wonderful looking baskets. Scissors seem to be the theme this year. I am okay with that!!! Back later, faithful reader. I should have sent money for raffle tickets! Hope you win something shiny, sharp and fabulous, or pretty and sweet, or a little of all! I will just live vicariously. Thank you again for the updates! Thanks for being the Anderson of the smocking world for us non attendees. 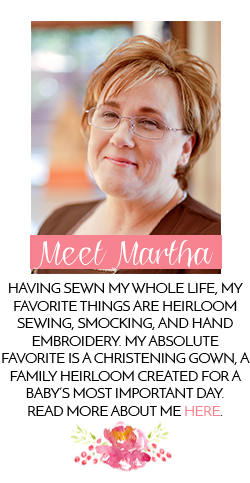 We are living vicariously through you, Martha, and want every detail. Spare us none.